We will offer community engagement in panel discussions and solution-based conversation concerning critical issues. – What has worked and why? Identify specific successful examples across the re-imagining themes, identify the most successful legislative support, identify the support networks needed, short vs long term success/challenges/obstacles. -How will people be see and understand what is meant by ‘The Beloved Community’; what does a beloved community look and feel like? We will increase the Detroit community and national communities in the realization of a collective vision through our conversation and shared goals. -identify common themes within Detroit and nationally. We will enjoy new friendships and fellowship. Thanks to all that came out to the first meeting! Our next meeting will take place Friday, May 11 from 6pm-8pm at The Brecht Forum. Subsequent meetings will take place on Tuesdays from 6pm-8pm at The Brecht Forum. Our next meeting (May 11) is the last opportunity, during this 6 week block, for new members to come in. We will reopen the meetings to new members in July. Please come to the next meeting with our weekly readings already read. They are posted under the “weekly readings” tab above. For those who cannot make the meetings but would like to read along, or folks in other locations who would like to set up similar work groups, feel free! And let us know! 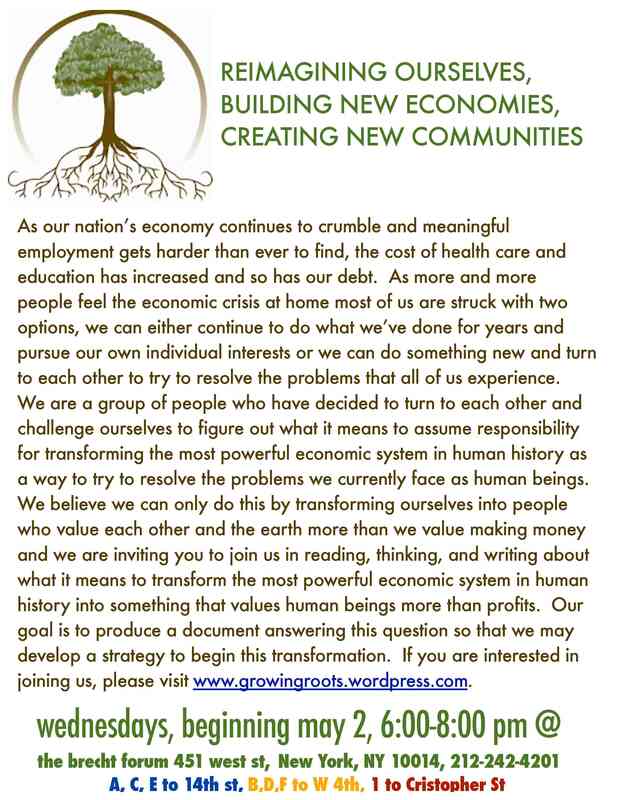 Please come join Growing Roots at the Brecht Forum on May 2 as we plant seeds to grow roots. We will meet 6:00-8:00 and discuss what we need from a community and what we need from an economy. We will also discuss how and why we started, what we hope to do, and just generally build with one another. Come plant seeds and grow roots. The Brecht Forum is located at 451 West Street between Bank and Bethune.